Cars parked on snow emergency routes in the City of Philadelphia will be towed starting at 21:00 Friday. PPA garages in Center City are offering flat-rate $5 parking for each 24-hour period. SEPTA will be shutting down all service except the Market-Frankford and Broad Street Lines at 4:00 AM Saturday. CCT will run for dialysis patients only. Bus, trolley, NHSL, and Regional Rail service will resume, as conditions warrant, beginning Sunday morning. PATCO will run modified schedules on Saturday and Sunday. Amtrak is reducing train schedules today and Saturday. NJ Transit will cross-honor all fares from 0:01 Saturday to 23:59 Sunday, but has not announced any service reductions, cancellations, or detours. DART First State has suspended all bus and paratransit service all day Saturday. All flights at Philadelphia International Airport are cancelled on Saturday. Some Friday evening flights have also been cancelled. The Pennsylvania Turnpike is reducing speed limits to 45 mph and banning certain types of truck trailers as of 0:01 from Breezewood to the Delaware River, and north on the Extension as far as Lehigh Valley. The New Jersey Turnpike reduced speed limits to 45 mph south of Exit 6 (Pennsylvania Turnpike) at 19:17 Friday evening. I wasn’t expecting to speak at Monday night’s hearing on the NEC FUTURE Draft EIS, mostly because I failed to do my homework and realize that they would be accepting spoken testimony. So I winged it, with some hastily jotted notes. Here are the highlights of that extemporaneous speech, heavily revised and extended, as best as I can reconstruct it. The best criticism of the NEC Future proposals is and remains Alon Levy’s “When There’s Nothing Left To Burn, You Have To Set Money On Fire“, which you should read if you have any interest in the subject. Summaries of the presentation and hearing as a whole have been written by (in publication order): Jason Laughlin of the Philadelphia Inquirer, Sandy Smith of Philadelphia Magazine, and Jim Saksa of PlanPhilly. My name is Michael Noda, and I am a writer on transportation topics. I am also an advisor to The 5th Square Political Action Committee, but my views tonight are my own. My main motivation in speaking tonight is to see a better NEC with the ability to serve many more passengers over both commuter and intercity distances. That’s why the proposals that have come out of the NEC FUTURE EIS process are so disappointing. They aren’t coherent about delivering either performance or capacity upgrade value for the money. In fact the $290 billion price tag for Alternative 3 (“Transform”) is so far divorced from reality that it calls the entire process into question. Alon Levy suggests that performance upgrades equivalent to Alternative 3 can be had for less than $15 billion in capital upgrades. I’m far more of a cynic, and think it would cost three times as much as Mr. Levy thinks it will. So instead of achieving radical transformation of the Northeastern economy at 95% cost savings, I think it can only be done at 85% cost savings. That is still an incredibly damning indictment of the process to date. Some of that cost bloat comes from the high costs associated with American public-sector construction. Far more comes from scope bloat and the inclusion of entirely unnecessary so-called “improvements” that add billions of dollars in cost, for negligible benefit. The proposed tunnel down 12th Street here in Philadelphia, to serve a new deep-cavern station under Market East, included in Alt 3 (“Transform”), has been widely mocked and derided, and rightly so. The economic center of gravity of this city today is at or very near 30th Street Station, and splitting future Amtrak service between two downtown stations is not an improvement for any riders, even the ones with origins or destinations immediately adjacent to 12th and Market. The most optimistic cost estimate of that tunnel could provide gold-plated versions of necessary rail infrastructure upgrades, throughout the Greater Philadelphia area. But the terrible and wasteful ideas aren’t confined to Alt 3. Alt 2 (“Grow”) includes an inexplicably perennial proposal to detour the NEC to the Philadelphia International Airport. That might be a good idea for American Airlines. If they agree, they should get out their checkbooks and pay for it. The Airport detour has no transit value. Not enough people are in the market to ride Amtrak to catch a flight out of PHL. Even if we build it, they won’t come. The large cities on either side of us have three airports each, and have a combined better selection of flights than we do. And the airports nearest us, BWI and Newark Liberty, already have excellent connections to the NEC. Again, maybe there is particular benefit to American Airlines and its passengers, but looking after their interests is not the remit of either Amtrak or the Federal Railroad Administration. In sum, the project alternatives are wonderful proposals in the Land of Infinite Money, and if the FRA is willing to tell me how to get there, I will emigrate at the first opportunity. But in the meantime, we live here, where our resources are finite, and determined (in this context) by our political masters. Of much more interest to Philadelphians, and much higher return on public investment, is the prospect of improvements to interlockings and curves along the NEC that would allow for more and faster trains through the existing plant. In this area, the biggest problem areas are at: Frankford Junction, site of the Amtrak 188 derailment last year; Zoo Junction immediately north of 30th Street Station; and PHIL interlocking, where SEPTA’s Airport Line joins the NEC, and inbound SEPTA Wilmington Line trains cross over the NEC at-grade. The straightening of curves to 4000 meter minimum radius, the installation of high-speed turnouts to replace switches designed by the Pennsylvania Railroad for far slower trains, and other such improvements will shave significant time from the journeys of suburban and intercity passengers alike. This process should be done with closer attention and respect paid to the surrounding landscape; the FRA’s Alt 2 seems to show a straightening of the curve of the NEC between Zoo Junction and the Schuylkill River, which is laudable except that the area inside that curve is also known as the Philadelphia Zoo, and to say that that land is not available for any at-grade or elevated option is to put it very mildly. As well, the construction of additional flyover ramps at these locations will greatly increase the amount of concurrent traffic the NEC can handle, by allowing simultaneous intercity and suburban movements where today those trains conflict and must stop and wait for each other; this would be especially valuable on suburban rail routes like the SEPTA Wilmington/Newark Line and the NJT Atlantic City Line, which suffer from low ridership as a result of their abysmally low frequency. All of these are very unsexy fixes that will not result in ribbon-cutting ceremonies and photo opportunities, but they will improve the NEC to true High Speed Rail standards within a realistic budget. And even in Alt 1 (“Maintain”), the alternative mainly focused on such bottleneck improvement projects, there is little attention paid. Again, I take no particular joy in making these criticisms. My call for efficiency is is rooted in a desire for abundance, that is, for an NEC that can live up to its potential as a High Speed Rail connection between the cities of the Northeast. But the only realistic way to achieve that goal — a goal I do believe the FRA genuinely shares — is to guard vigilantly agains unnecessary scope bloat and excessive unit costs. An attentive agency ought to have realized that a price tag that is twice as much per kilometer as maglev between Tokyo and Nagoya, for inferior service, was a red flag that its process was broken, and taken steps to correct itself before releasing the Draft EIS to the public. That opportunity may have passed, but it is not too late for the FRA to correct its course. I sincerely hope that it does so. No more “SEPTA Key is Late” complaints. It’s very late. We all know it’s very late. We know, very approximately, why it’s late. But we’re now being promised a rollout date by April, which is not actually far enough away to be the indefinite future anymore, even under the worst circumstances imaginable. I’m not saying now is the time to get hype. I’m not even saying we shouldn’t all still be pissed at the accumulated delays. I’m just saying I’m tired of rehashing the “it’s late” narrative every week or so. Unless you are actually doing a longform deep dive on the dysfunctional relationship between the public sector and software development (i.e., you are Jim Saksa last month, or trying to one-up him), you are engaged in weaksauce, populist, pseudojournalistic pablum, and you should be ashamed of yourself. One Loading Zone per Block. Now. 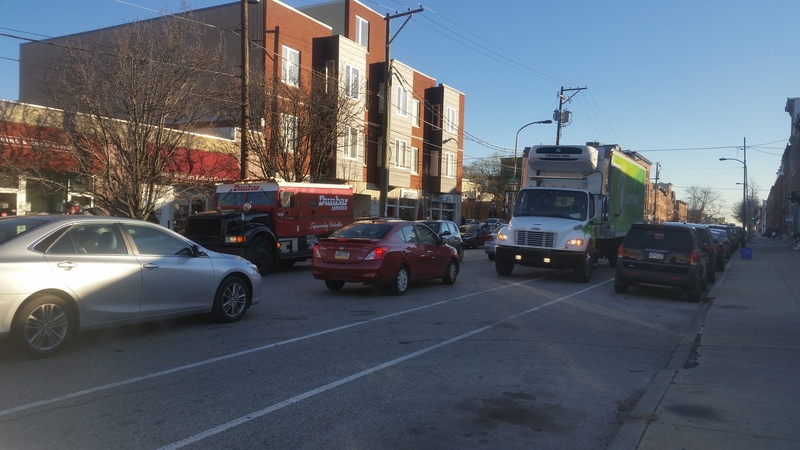 Both bike lanes blocked (and traffic lanes fouled) by trucks facing west, 1900 block of Fairmount Ave. So much of the unsafe or even inconvenient conditions on our streets comes from delivery vehicles who, in fairness, have few better options. And delivery vehicles are only going to proliferate as delivery services get cheaper and more widespread, and our neighborhood commercial corridors fill back in. It’s all well and good to swap door-zone bike lanes with parking-protected bike lanes, (and we should get on that, pronto), but that’s not going to fix the root cause of these problems, and it’s not going to do anything at all on the vast majority of streets that lack bike lanes. Fix the CMX-2 and CMX-2.5 zoning categories. Speaking of our neighborhood commercial corridors coming back, it would sure be nice if we had mixed use zoning categories for those corridors that were usable by-right. If you have an example of by-right new construction in either of these zones since the new zoning code came into effect, leave it in the comments, because that will be the first I hear of it ever happening. Signatures on the dotted line for University SEPTA. Bundling deeply discounted SEPTA (and Indego?) into tuition at colleges and universities is a win for everybody, we just need to finalize the details in time for the new SEPTA tariff scheduled to go into effect this July, and the next academic year starting in August. Even if, gods forbid, we miss that deadline, placeholder language should go into the tariff so that the program can kick off next winter instead of waiting an entire year. The time to move is now. An Open Streets PHL debut to do everyone proud. Ever since the Pope’s car-free security perimeter (peri-miter?) got everyone interested, a lot of people have been working to bring Open Streets to Philadelphia on a more regular (and better-planned, less disruptive) basis, starting sometime when the weather warms up. You might even recognize some of the names. Mayor Kenney is very much on board. So let’s do this. Street sweeping. Can we take the most basic step necessary to shed our “Filthadelphia” image? Even if it means people have to move their cars every once in a while? If New York (more crowded) and Baltimore (poorer) can figure out how, we can. Candidate Jim Kenney suggested an opt-out as political cover; I hope Mayor Jim Kenney doesn’t stick with that, but if he does, it should be the most restrictive opt-out possible, i.e. by-block, by supermajority petition, with an automatic sunset unless renewed by the same supermajority. Move the ball forward on badly-needed project planning. SEPTA trolley replacement. King of Prussia Rail. Broad Street Line to the Navy Yard. City Branch Transit. The Rail Park (going north, not west, and yes I will fight you, FOTRP). The 30th Street Station District. Reconfiguring the Northeast Corridor through North Philadelphia. None of them are getting done this year, but we can do more to make sure they get done as soon (and as inexpensively) as possible. Restripe Washington Ave already. The amount of gridlock and lack of leadership on this one is appalling. The PCPC-led design process resulted in a good plan for restriping. Follow-through on that plan didn’t happen largely due to lack of political leadership. So anarchy continues to reign on South Philadelphia’s emerging main street. If anybody dies on this street in the new year, you’re going to read some very unkind words here. Exclusive bus lanes on Roosevelt Boulevard, Market Street, and JFK. Super-wide streets with frequent bus service need bus lanes. Full stop. Hourly SEPTA service to Wilmington, already. The addition of one more train in each direction each weeknight serving Delaware’s largest city (and Philadelphia’s largest transit-accessible suburban job center) was a highlight of our December, but it was marred by the lack of a counterpart train on Saturdays that had been previously announced. Delaware needs to cut it out with this piecemeal nonsense and actually approve funding for hourly (or better) SEPTA service to Wilmington en bloc, as it’s the most cost-efficient transit in the First State, and will only attract more riders if those riders can rely on there actually being a convenient train when they need it, in both directions. I’m not terribly optimistic for anything more than incremental improvements, but I haven’t entirely run out of hope for more. Half-hourly service to Norristown and Chestnut Hill East. Jeff Kneuppel floated this in September 2014, as SEPTA’s deputy GM. He’s now in the big chair, and we’re still shivering with antici– (say it!) –pation. Or maybe just with the cold, waiting for trains that are still hourly. Light the Manayunk Bridge. Yes, I’m fully on board that the highest and best use of this iconic viaduct is as a multi-use trail. But multi-use involves being, er useful, and the Manayunk Bridge won’t be until we put lights on it (and the Cynwyd Heritage Trail) so that it can open early enough for commuters and stay open into the evening. Half a bridge (i.e. what we have now) is better than no bridge, but let’s not lose sight this project with the finish line tantalizingly in sight.